The readers have spoken! And in a vote that mirrored the Archetype Breakdown from many of our events (You guys weren’t just voting for your deck were you?) the Legacy community was split on the deck that they wanted featured. In the end Counter-Top won out and it offers a lot for analysis. Looks like it will be worth looking into another of these Archetypes over the summer when we get our next break in the schedule. Counter-Top offers an interesting challenge because the combo itself is primarily defensive and can not win the game on its own. The decks from Indianapolis and Orlando used eight different paths to victory. Exactly half of the decks used Natural Order to bring Progenitus onto the battlefield for a quick finish but the Counter-Top combo is small enough to be fit in alongside many of the other Legacy powerhouses such as Painter’s Servant / Grindstone and Phyrexian Dreadnought. There were 48 Counter-Top decks and some quick math will show 51 total decks above. Don’t worry my addition skills are not that bad it’s just that 3 of the decks managed to cram two win conditions in alongside the main Combo. Two decks featured the Landstill pairing of Phyrexian Dreadnought and Mishra’s Factory and one paired Dreadnought with the Painted Stone combo. Let’s focus a little on the two major sub-archetypes - Natural Order and Combat – and their card choices. The Combat decks differed from the Natural Order decks mostly in what they were missing: Natural Order Progenitus and Noble Hierarch. While Natural Order decks generally stuck to Bant colors the Combat decks were greedier for colors and answers often using Black for Dark Confidant Engineered Plague and other utility cards. 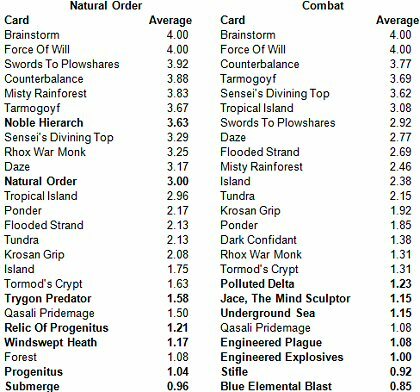 On the whole the Combat decks were generally outclassed by the Natural Order deck as one might guess in Legacy. Honestly if you aren’t doing broken things you are falling behind. The cards in bold do not show up on the other top 25 list. With so little data for the Combat builds it’s hard to draw any relevant conclusions. The Natural Order decks seem to have a significant problem with Merfolk Goblins and Landstill suggesting that the strategy is prone to being overrun if an opponent can get out to a quick lead. Finally here’s the spreadsheet so that you can draw your own conclusions. Thus concludes the first Too Much Information Spotlight. Please let me know if there are things that you would like to see in the next Spotlight article. As this is my first focused breakdown I am sure that I can do better and I am happy to have your suggestions to help me figure out how.